I just finished making this “dishcloth” but it is a mammoth of a dishcloth. It is really pretty but not very practical for washing dishes since it is about 10 inches in diameter. Could you imagine washing dishes with something as big as a large pie? Or a record? (if anyone knows what those are anymore) It is bulky too except for the center. I think I’ll use it for dusting and I won’t be making more of them. This thing took me parts of 3 days to make since my hands have been hurting so bad but they say it can be done in two hours. I really doubt it but it is an easy pattern. 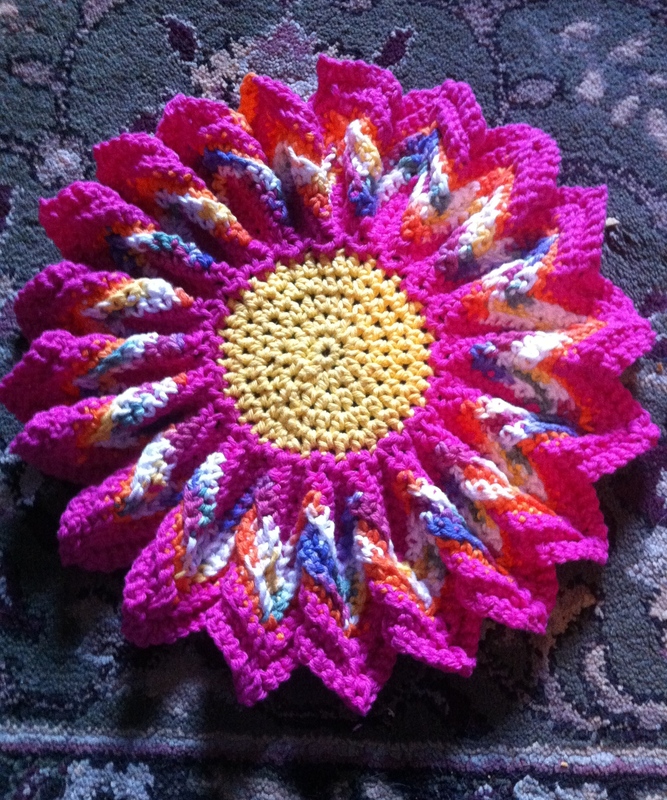 I am thinking it might me more practical as a washcloth for a little girl to use in a bath. I might just give it away for that purpose. I hate to waste it since I used so much of my cotton yarn in it. Kinda reminds me of the crochet oven mitt someone gave me that had lots of holes for your fingers to slip through. It was also made out of acrylic yarn so it would have melted if I actually used it. You have to use natural fibers for stuff like that. I use 100% cotton. When I make something I like it to be useful. I don’t like to make something that will just sit on the table and look pretty, which is probably why I haven’t made any doilies. I might actually make one out of tatted lace for my end table that people keep piling with junk. Then I’m going to get a piece of glass cut to the size of the table so it wont get dusty. Anyway, today I decided to make another dishcloth I found on ravelry.com. 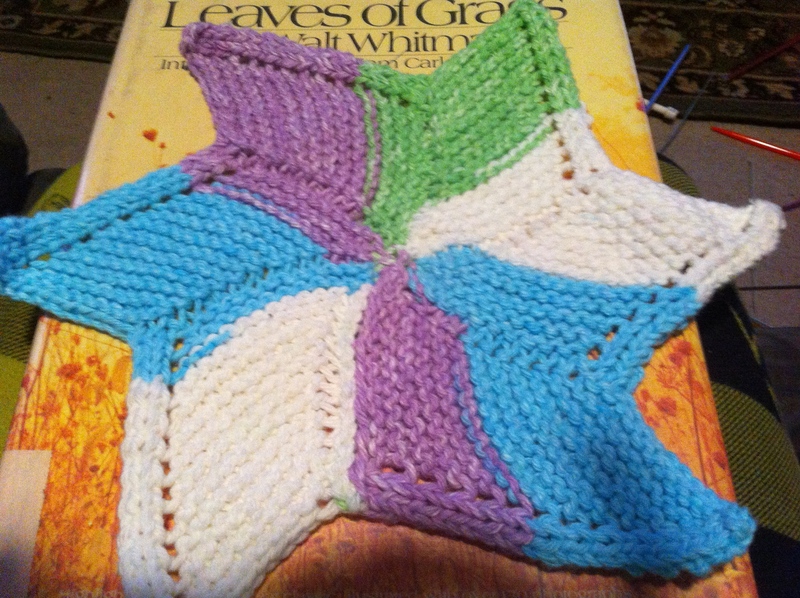 It is a really cool knit star cloth. It was really easy and I really enjoyed making it. I really like this one and I will probably make a lot more of them. Isn’t it pretty? It is a more practical size for washing dishes too. I like both of these! The huge one is really pretty, and I bet the star would be great for getting into narrow glasses and stuff.